May 14, 2018 – Bicycle Commuters will have a pleasant treat on Tuesday morning, May 15, 2018. 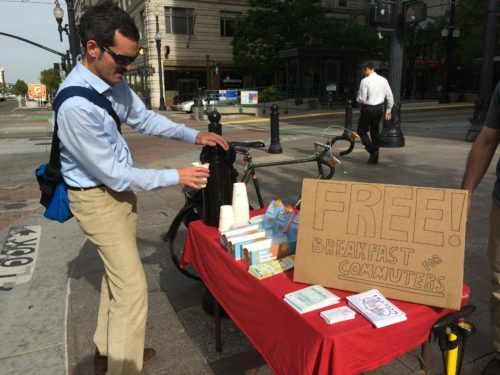 At least 17 locations in Salt Lake City will be hosting Bicycle Commuter Pit Stops as part of Utah Bike Month. The stops will typically have a treat and coffee to help commuters reach their morning destinations. Some highlights include Wasatch Touring, Sugarhouse Coffee, and the Salt Lake City Transportation Division. An interactive map shows all 17 locations, and a graphic below lists each location. 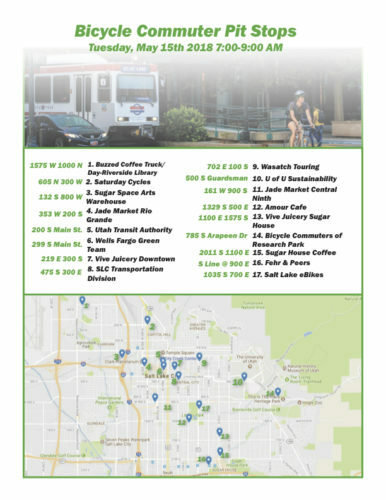 Salt Lake City Bicycle Pit Stop locations for May 15, 2018. Pit Stops will be open from 7 am to 9 am.